Skylake X has landed with a bang, bringing substantial performance improvement to an already over-achieving CPU family. The W299 gives this newest extreme Intel processor line a comfortable home and makes the possibility of owning a 18 core & 36 threads monster down the line real. 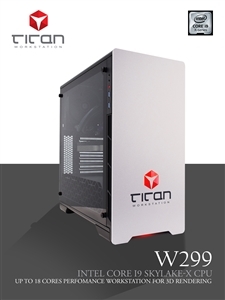 The Skylake X powered Titan W299 now represents high-end processing power at a surprisingly affordable price. With its sporty twin-fan front intake and clean sports car lines, you’d be forgiven for thinking that our W161 is another hotrod PC meant for entertainment. The truth is this one of our most balanced workstations aimed at accelerating the workflow of CAD/CAM professionals while providing enough multi-core power to remain flexible. 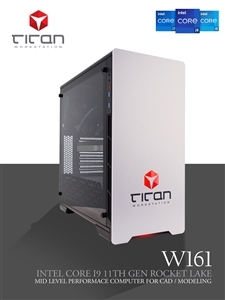 Sporting the latest Intel Coffee Lake i9 technology, the W161 is a sign that your CAD workstations need an upgrade. Skylake X has landed with a bang, bringing substantial performance improvement to an already over-achieving CPU family. The X299 gives this newest extreme Intel processor line a comfortable home and makes the possibility of owning a 8 core, 16 threads monster down the line real. 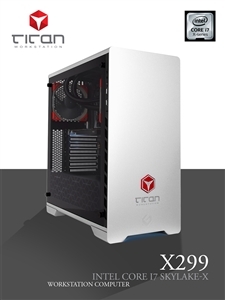 The Skylake X powered Titan X299 now represents high-end processing power at a surprisingly affordable price.